After a fun mini photo session in the arena, Wizard and I went out on a twilight Summer Solstice trail ride with Kris (pictured above with Philly), Rachel, and Ashley. It was getting dark, so we rode around the short loop at a walk. Unlike last year, the fireflies were not quite out in full force. Wizard seemed a little out of sorts. He was not walking as long/fast as he usually does and he was a little grouchy. 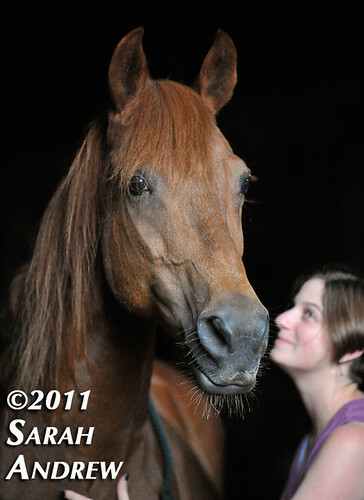 When we got back to the barn, I trotted him around the outdoor arena for a few laps. He felt responsive and willing. In the barn, I took his temperature just to be sure something worse was not going on, but it was normal (99.5). His appetite is fine, and there is nothing outwardly wrong. He just does not seem quite right. We humans have “off” days. Perhaps he’s having one too? He didn’t sleep well because the mare down the aisle was snoring too loudly? Or someone pee’d in his grain (Cheerios)? A hug, a kiss and a good night’s rest might just have him right as rain! (I understand the worry. I’m the same way when one of my critters is “off” and I can’t find a reason for why).